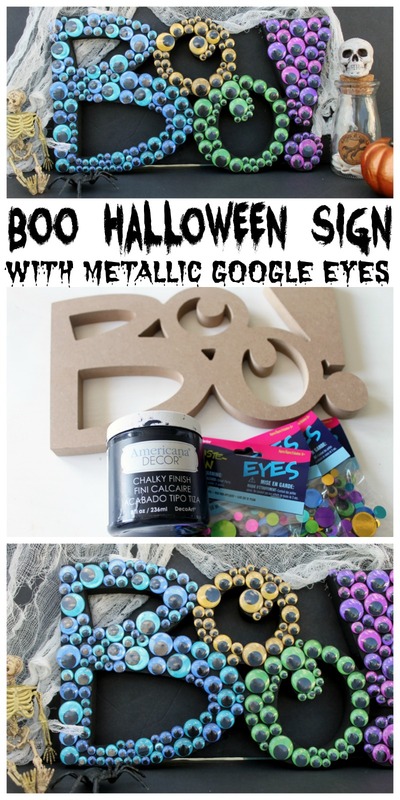 Make this boo sign for Halloween with just a few simple steps. 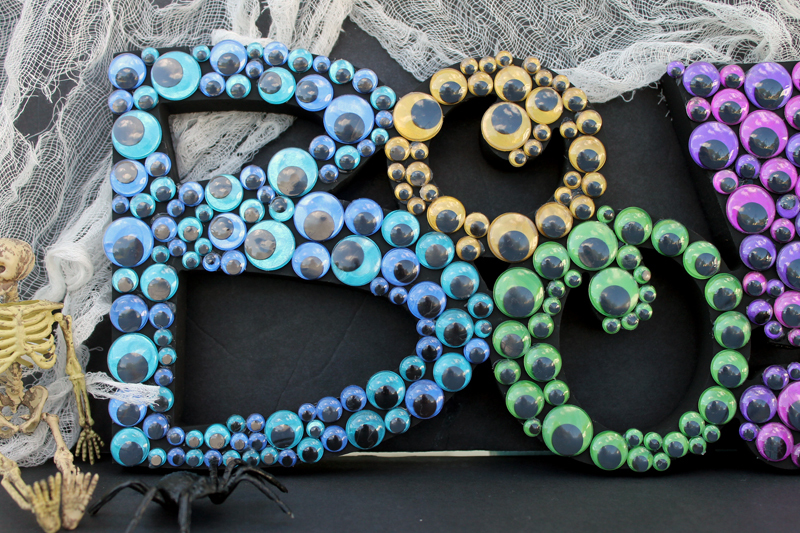 I love the use of the eyes in this case and what they add to this project. Get your supplies and get started on your own version of this fun sign today. This one was originally posted over at Crafts Unleashed where I am a paid contributor. 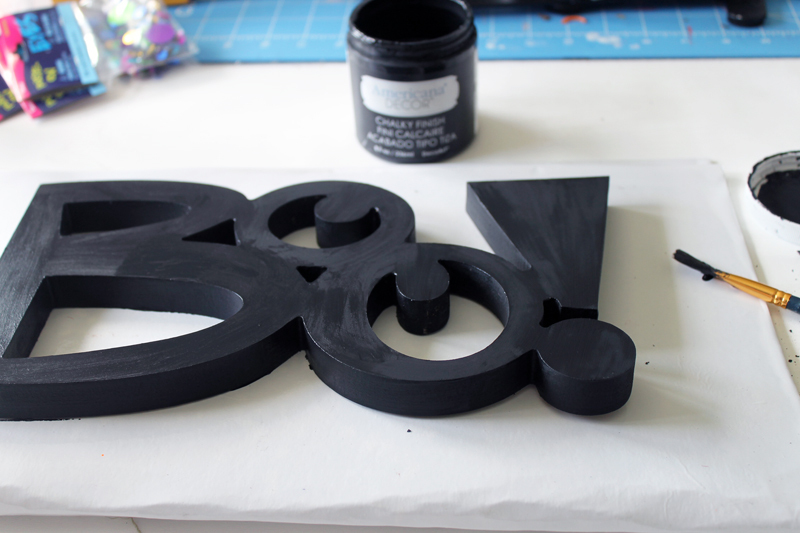 Start by giving your boo sign a few coats of the black chalky finish paint. It will take one to two coats to get adequate coverage. Be sure to let everything dry completely before continuing. 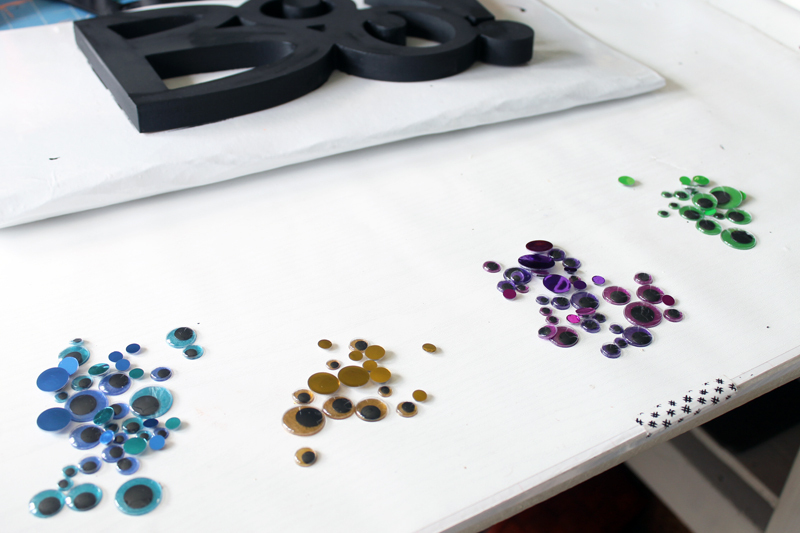 In the meantime, you can sort your googly eyes into colors. I did put blue and aqua into one pile as well as pink and purple. 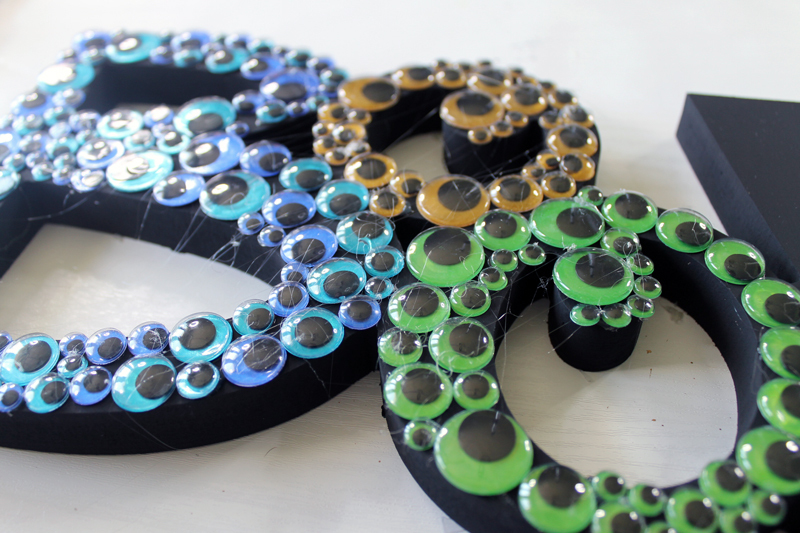 Then just start using your hot glue gun to add the eyes to the sign. I used the amount I had of each color to determine where on the sign they would go. 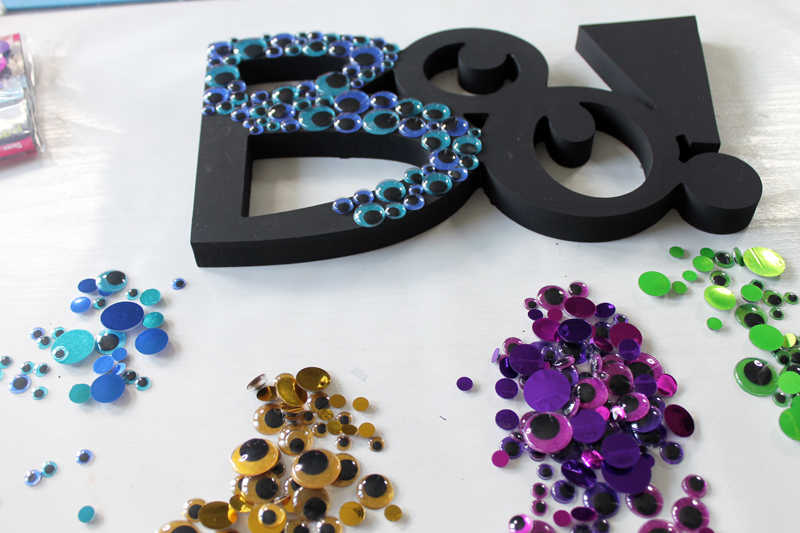 For instance, I had more blue/aqua so I put it on the “B”. Continue adding eyes until the entire surface of your sign is covered. I also had a TON of glue strings. Pull as many off with your hands as possible then use a hair dryer to melt the rest. CAUTION: The hair dryer will also melt the google eyes if left in one place too long. 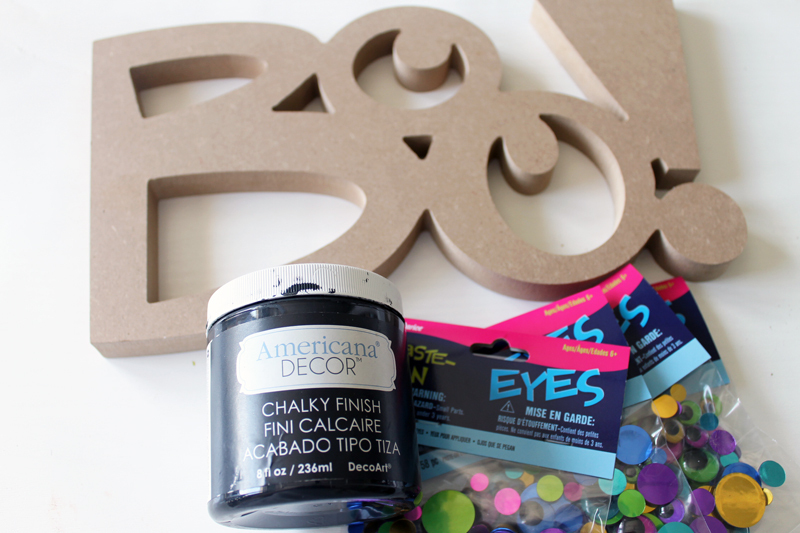 Once those glue strings are gone, you boo sign is ready to display anywhere around your home. I added my potion bottle as well as a metallic painted pumpkin to this display. Cheese cloth is also one of my favorite elements to use to decorate for Halloween. 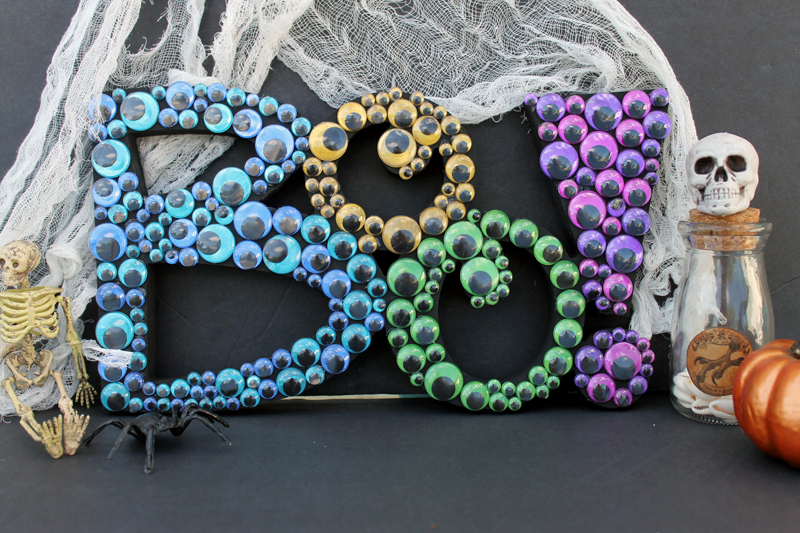 Get ready for Halloween by making your own boo sign. You will love how this one looks in your home. Love this and want more ideas? Be sure to check out the links below. 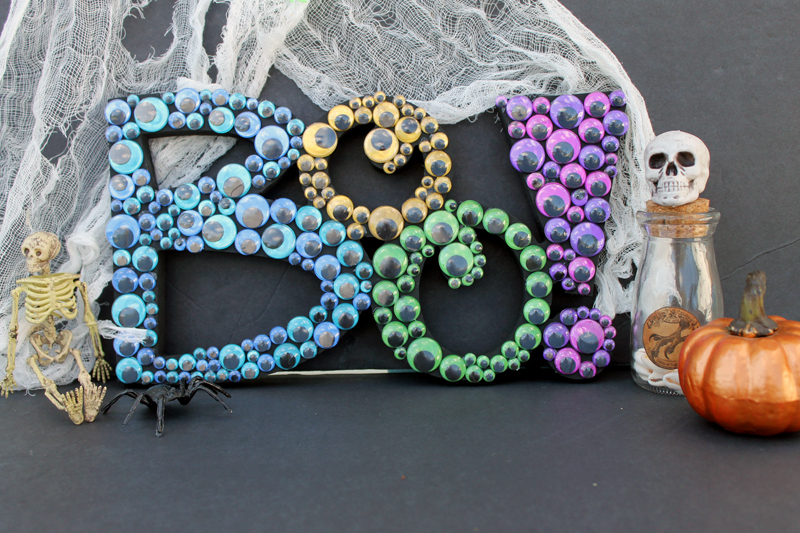 Now that’s one cool looking boo sign! Love the idea of using googly eyes. One of cutest Halloween decorations have ever seen, great job Angie. It would take me a lot of patience to glue all those googly eyes on, you made it look so awesome, great placement. Will look for that boo sign for our daughter, she lives in subdivision where there are lots of little kids trick or treating, we don’t get any kids out here, never have in all the time have lived here. I decorate with Fall items. am working on a cotton boll wreath placed on a cabinet door now. (sorry if already told you that). Can imagine how you decorate your home with young grand kids around.